Since ending development of Windows Phone, Microsoft has been working on new features to bring Windows PCs and Android/iPhone closer. Last month Microsoft officially launched the new Your Phone app to help you view the photos, messages stored in your smartphone directly from your PC. The Your Phone app also allows you to send the messages through your PC, along with giving you access to the old message conversations. The Windows maker last month also announced some new features for Windows 10 Your Phone app that would allow you to mirror Android apps onto your desktop screen. According to multiple reports, Microsoft is now working on another interesting feature that would transfer phone calls to PCs. The evidence has been spotted in a Windows 10 19H1 Shell called “Windows.CallingShellApp”. This report has now been confirmed by the reliable Microsoft watcher Albatross, known for observing a lot of hidden changes in Windows. According to Albatross, Windows 10 19H1 update will also come with support for conference calls. “19H1’s shell will support conference calls. Guess this is a bit more than just standard phone call support,” Albatross tweeted. “You’ll be able to send a call to another device, whichever direction you wish. Phone to PC or PC to phone”. You will be able to reject the call, receive it and initiate a call by dialling the number on keypad directly from your connected Windows 10 PC. Clipboard also referred to as pasteboard is a feature that temporarily stores content that has been copied or cut from a document, picture or a file. With Windows 10 October 2018 Update (version 1809), Microsoft introduced support for Cloud Clipboard. If enabled, you can view the history of the data that you cut or copied from a document. 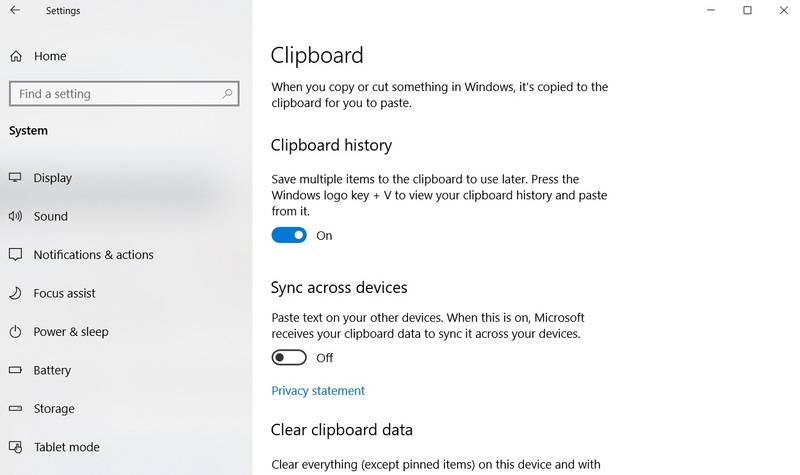 At the moment, the clipboard can be synced to Windows 10 devices only but this is going to change as you will soon be able to sync your PC’s clipboard to your phone. It means you can finally view the PC clipboard content from your phone. For example, if you copy a text (phone number, address) on your PC, you will be able to access it on your phone. All these changes are expected to arrive early next year with Windows 10 19H1 update but at this stage, the phone call transfer feature is not confirmed.